Children at this age are quickly growing and changing. 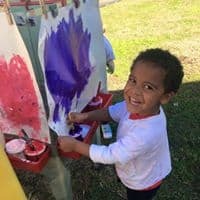 Primary Colors Toddler Two Program continues to develop social-emotional skills, language skills, and a love of learning in an environment that cultivates positive habits that will last a lifetime. We encourage a healthy lifestyle and keep our little learners engaged and having fun. Our Toddler Twos curriculum is designed for active children and curious young minds. Our classrooms are designed to meet stimulating experiences in a secure environment for 2 and 3-year-olds. Throughout the day our teachers provide creative activities for your child’s imaginative play, language, movement, art, and social-emotional development. 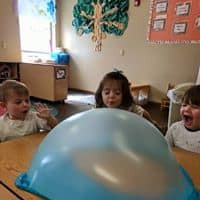 Your child will become more independent by continuing to make choices and will gain strong cooperation skills and confidence needed for success in preschool and beyond by working with a group of peers. Recent brain research indicates: Birth to age 3 are the most important years in a child’s development. This is the time when your toddler grows in leaps and bounds cognitively, socially, emotionally, and physically. Primary Colors focuses on all areas of development, cognitive, social, emotional and physical to ensure your child’s early childhood education is well-balanced and will lead to long-term improvement in school success and higher educational attainment. Cognitive: Early childhood is the most intensive period of cognitive development. Critical factors include a safe, predictable environment, responsive, nurturing teachers, and engaging language-rich activities. 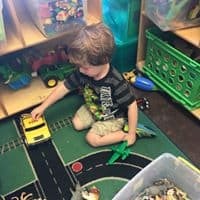 Social-Emotional: Our teachers lay the foundation for successful interpersonal relationships by creating nurturing relationships with toddlers, modeling appropriate behaviors and responses, and communicating effectively about emotions to foster healthy social-emotional development. Physical: Movement is the work of toddlers. 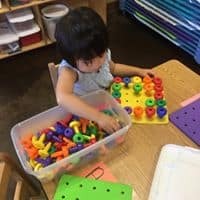 Tossing a ball, climbing on the playground, scribbling, moving trucks in the transportation center, or stacking blocks all continue to develop gross and fine motor skills. Discovery Time: Toddlers learn best through play as they explore and discover, and there’s no better place for this than the centers in our toddler rooms. Whether your little prince or princess is building with blocks, painting a masterpiece, or using a magic wand to change a pumpkin into a coach, your little one can imagine to their heart’s content with all the props, costumes, and art materials in the classroom. Early Learning: Our theme-based curriculum nurtures your toddler’s excitement for learning with fun, age-appropriate learning activities involving language, colors, shapes, motor, art, music, and movement. Sign Language: Your toddler will continue to learn and use sign language. There are many times when a young toddler does not have the verbal language to express a need for an emotion and this can be frustrating for your toddler. Sign language gives toddlers another way to express their needs and emotions as their verbal skills develop.